Use this screen to define home page configuration for different user languages, that are displayed in the external interface. 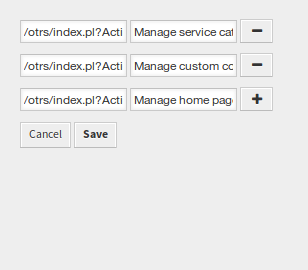 The home page management screen is available in the Home Page module of the External Interface group. This screen contains several widget for each languages, where localized content can be added. This is the most important sentence or motto of the home page. Select an image used as background image for the hero unit. To select an image, click on the Select image to upload button and chose an image from your file system. 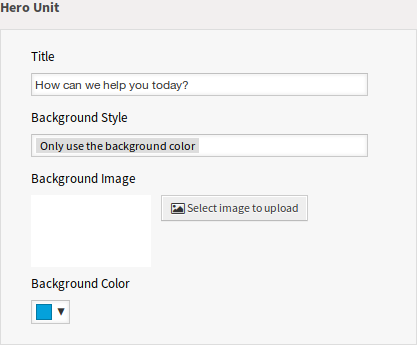 To change the background color, just select a new color from the color palette. You can chose from the pre-selected colors or define other colors by choosing it from the color selector or typing the hexadecimal value. This setting defines if the ticket list should be visible for logged in users or not. This is an optional title for the row, that contains this widget in the external interface. The image teasers are displayed in a separate row in the external interface. You can add up to three image teasers by clicking on the Add button in the top right corner of the widget. Select an image to display it in the image teaser widget. 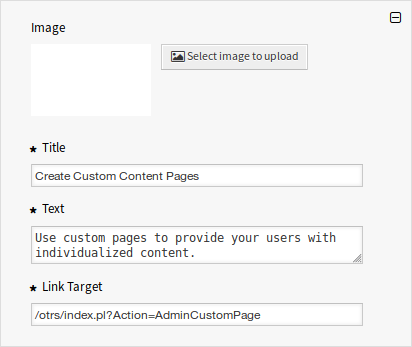 To select an image, click on the Select image to upload button and chose an image from your file system. The heading text that are displayed in this item. The text for this item. 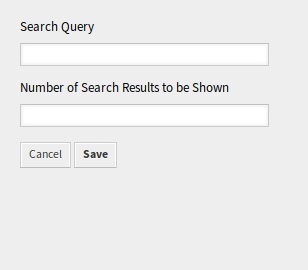 An URL that will be opened after clicking on this item in the external interface. 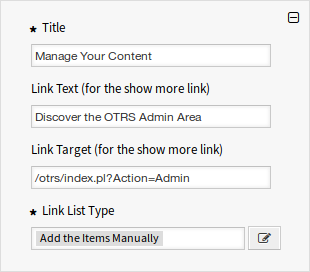 The link lists are displayed in a separate row in the external interface. 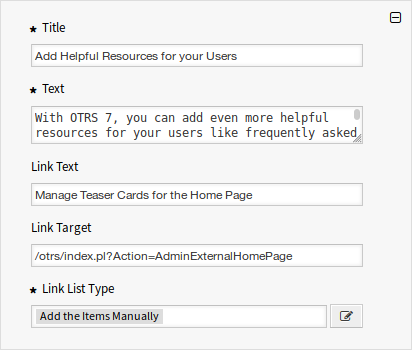 You can add up to four link lists by clicking on the Add button in the top right corner of the widget. Add the text for the show more link. Add the URL for the show more link. Specifies the functionality how the item will be added. Clicking on the edit button a new widget will be visible to add the items. You can add up to three content cards by clicking on the Add button in the top right corner of the widget.